With the option of starting at Alice Springs or Ayers Rock, this 4 Day/3 Night adventure finishes at Ayers Rock. 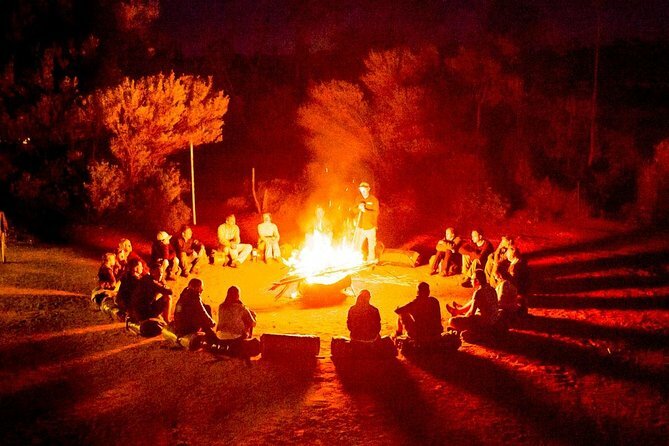 This Red Centre experience features private campsites where you have the opportunity to sleep around the campfire in an Aussie Swag. Travel in an air-conditioned minibus and absorb the fascinating history of the area and its people provided by your experienced guide – all of this while traveling with other fun loving and active travelers from all over the world ... and of course you will hike, climb and explore Uluru, Kata Tjuta and Kings Canyon and visit the Outback town of Alice Springs! It’s an early rise if you are joining the tour in Alice Springs where you will make the journey to Ayers Rock to meet your fellow travelers who are joining there. *Lunch is included for those departing from Alice Springs only). This afternoon embark on an interpretive walk at the base of Uluru (Note: Uluru is a sacred site and the Anangu people ask visitors to respect their law and do not climb). The Cultural Centre is impressive and well worth a visit before watching the ever changing colors of Uluru at sunset. After dinner, some stories and stargazing, it’s time for a good night’s rest at our private campsite before another active day tomorrow. Your guide will wake you bright and early to experience a mesmerizing Uluru sunrise, early mornings being such a magical time in the desert. Then it’s a short drive to Kata Tjuta (the Olgas), an aboriginal word for “many heads”, to explore its domes of which there are 36 in total. Pull on your hiking boots and take the Valley of the Winds walk through creek beds, domes and beautiful wilderness. After lunch, it’s farewell to Uluru – Kata Tjuta National Park as you travel to Kings Creek Station to spend the night at your private camp. This morning enter the Watarrka (Kings Canyon) National Park, home of a mighty chasm with sheer red rock faces which soar over 100-metres above lush palm forests. The rim of Kings Canyon is a 6-kilometers round trip walk and you will visit the Amphitheatre, Lost City and tranquil Garden of Eden. After lunch, make your way towards the iconic outback town of Alice Springs, arriving in the early evening. This town has a vast pioneering history and will feel like the big smoke after 2 and a half days in the ‘Bush’. You won’t need your swag tonight, as your hostel accommodation is included (dormitory or UPGRADE to twin or double room) along with dinner at the hostel. Later, you’ll have the chance to wash your dusty clothes before experiencing the nightlife of this charming outback town (at your own expense). Today you have an early start. Following breakfast (provided at the hostel) leave Alice Springs and begin the journey to Ayers Rock. With a short stop along the way you will be dropped at the Ayers Rock Airport or resort before saying farewell to this magical destination. 2 nights camping and 1 night hostel accommodation in Alice Springs. $25 Uluru National Park entry fee is payable direct to the supplier prior to departure for tours departing prior to 01 April 2019. Uluru National Park Fee included for tours departing from 01 April 2019. This Safari is not suitable for children. Camping is in swags on this safari. For guests requiring a tent there is a $60 per person hire fee payable direct on date of travel. Tents are limited and must be requested prior to departure. For those joining us at Ayers Rock lunch is not included on day one. Guest should have lunch prior to commencement of Safari.